Shashi Kapoor on facebook? Shashi Kapoor on facebook! 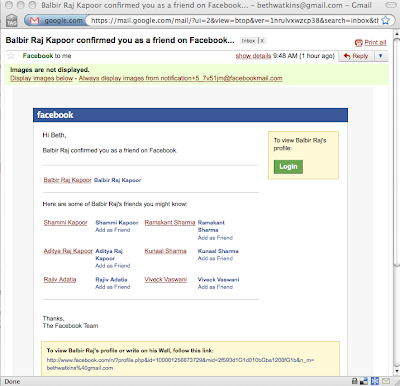 Update to post (September 13, 2010): Shashi Kapoor is NOT on facebook. A proper journalist called Prithvi Theatre and they deny it. Sigh. At least I can rest more easily knowing that Shashi himself did not publicly state that Saawariya is any kind of adjective related to "good." Nor in seeing a post that uses an emoticon, the strange public ramblings of fans (why yes, I am familiar with "irony"), and a comment that Saawariya "is very nice!!" Shashiji and I disagree on that one. So what do we think? Real and written by Shashi himself? Real and written by someone else? And why now? Is there a certain project he's got underway that he will be promoting? Or perhaps just generally wanting to be a bit more public and make his presence a little more prominent? I totally geeked out when I saw this. While I feel like Shashi has better things to do with his time--like being legendary and awesome--than to maintain a Facebook page, I still find this very exciting. wai wai wait, so is it him? do we have official confirmation? inquiring minds need to know! I've been skimming your blog for a while now and you really make the most interesting posts of the most banal movies-good job. I was curious to know if you ever bothered to watch soap operas from south east asia..The newest ones are really very similar to movies- an amalgamation of key scenes from several movies, and yet, oddly, I find a few worth watching- bad acting, makeup and all.. I'd like to suggest a Pakistani show that's on youtube and really, very watchable since its based on a novel. At 100 episodes, its a long watch, but I think you might like it ( I am assuming you follow hindi?). Unfortunately there are no subtitles on these videos. Sorry- I forgot to write the name in my earlier comment. The show is called Dil Diya Dehleez ( I think it translates into "Heart/love, lamp and threshold". I call shenanigans! Although that Saawariya plug is exactly the sort of thing a fond grandpa would write about his grandson's (close enough!) work. Slytherin - Sorry for my really late reply to your comment! It's so interesting you bring up the soap operas. I HATE American soaps (except ones geared at teenagers, for whatever reason), but I have several Bolly friends who do really like some soaps from various parts of Asia. I can sort of follow movie Hindi most of the time so maybe I'll give Dil Diya Dehleez a shot!